You are here: Home / Leadership / Dynamic Leadership / Read Any Good Books Lately? My first agency manager, Ray, always encouraged us to be readers. Two of my favorite “Ray Sayings” are “Readers are Leaders and Leaders are Readers” and “When you’re green you grow. When you’re ripe you rot.” While I’ve always been a reader, his encouragements have often steered me to books that can help me grow professionally. I recently finished reading such a book. 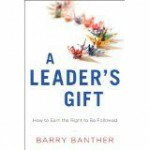 A Leaders Gift: How to Earn the Right to be Followed is one of the best leadership books I have read. Barry Banther uses just the right mix of how he had to learn about the 5 Gifts of Leadership the hard way along with real world examples where the 5 Gifts have helped leaders succeed and earn the right to be followed. Looking back at the Great Leaders I have had the privilege of knowing, I find that each practiced the 5 Gifts, perhaps knowingly, perhaps unwittingly; but, practice them they did. This is what made them Great Leaders. If you have any desire to become a Great Leader, this book is a must read!